When I got to the office today, I was presented with MORE thoughtful breast cancer awareness gifts. The women in our Staunton, Virginia office put together a cute pink gift bag just FILLED with pink ribbon items and inspirational sentiments. I was really overwhelmed. 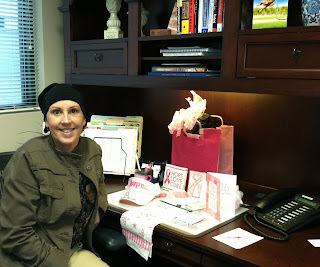 Here is a picture of me with all my little pink goodies... I am so blessed to work with so many wonderful people! I had my fourth round of chemo and met with my oncologist. Everything is going really well. No major side effects from the chemo besides the water retention. Even my hair is starting to sprout back just a little. I told my oncologist that I am feeling pretty good all things considered, if it weren't for this "cancer thing." And she said: "You need to start saying 'you HAD cancer' -- there is no indication that you have cancer now. This chemo is just a little extra precaution." So there you have it -- I HAD CANCER. That is going to take some getting used to saying. I really don't take cancer lightly. Can I ever be sure it's gone? Absolutely not. But I might as well stop living like it's lurking over my shoulder. As I said in my last post -- and this is what I said to my doctor -- I am ready to get this behind me and get my life back on track. She could not agree more. So this is my new mantra: I HAD CANCER. I HAD CANCER. I am a little tired from chemo but went to work today. I know that tomorrow and Saturday will be my days to crash and burn. That's fine, it's supposed to be cold and rainy here this weekend. It will be perfect for curling up in bed and reading or watching old movies. My husband and I have been watching "Mad Men" through Netflix on our Roku. We also queued up the old mini-series "The Winds of War." So my plan is to just get as much rest as possible this weekend because I am flying to Columbus, Ohio for a business trip on Tuesday and Wednesday. My oncologist saw no problem with flying and just told me to move if I am seated next to a coughing, sneezing person. She didn't even think I needed to wear a mask. That's good, right? I did have my flu shot while I was in for chemo yesterday. No reactions to it -- at least not any as of today. I have to go in for my Neulasta injection tomorrow morning. That usually gives me some joint and bone pain so I start taking Aleve twice a day on the day of the injection. I take it for about four days and that usually handles the initial pain and then I'm fine. My oncologist was very happy with that report because she said some people really can't handle the Neulasta injection. So that is my update as of today. Four down - two to go! woo hoo! I love the pic of you - and the fact that you have such supportive co-workers. But most of all, I'm just cheering for you and the fact that YOU HAD CANCER! Enjoy your weekend of R&R. Wow ! This is such a milestone. Your Mantra.... I love your oncologist and your coworkers ! Us, Virginians are pretty cool - eh!?! Great news...be good to yourself and chillax. I remember being done chemo and radiation and still saying "I have cancer" because I still felt and looked like I had cancer. I did not feel right saying "I had cancer" - it seemed so fake to me. I was scared I could never bring myself to use the past tense when I referred to cancer, but I found as the medical appointments lessened, and the hair grew back (I think that was a big one for me, because it implied 're-growth' - so in my mind 'survival') I started cautiously saying 'I finished my treatment for cancer' - for a few months and then recently, maybe last month I finally blurted out 'I had cancer' as I was speaking with someone new, and I was so shocked how easy it had come out. It didn't feel fake or anything. I think it's true - you don't have cancer NOW. But sometimes, when we are still in treatment, when we are sick, or bald, we FEEL like we still do - we even LOOK like it for pete's sake. So for me, I never could quite bring myself to say 'had' until my physical appearance matched it. I no longer looked/felt sick, therefore "I had".